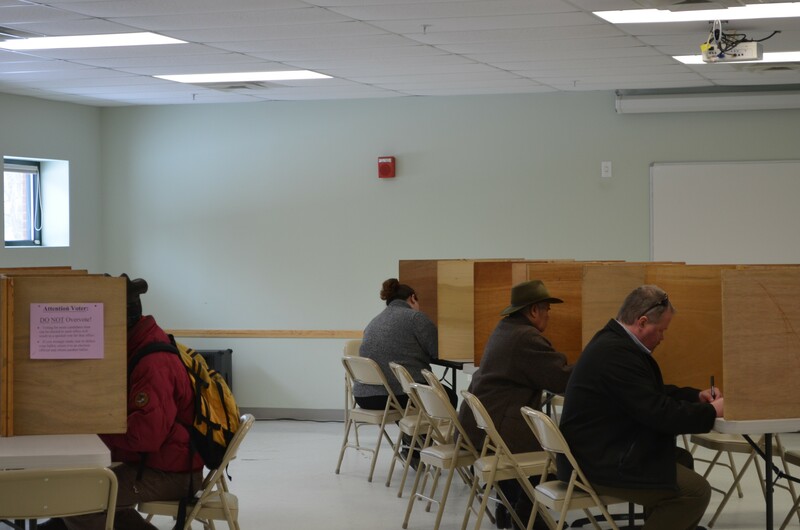 Burlington residents fill out their ballots on Town Meeting Day. The Burlington school budget passed by a very close margin Tuesday — too close for the comfort of at least one resident. Dale Tillotson, a Ward 7 voter who opposed the budget, has asked for a recount, and assistant chief administrative officer, Scott Schrader confirmed today the city will honor his request. State law lets registered voters request a recount if the vote is within 5 percent. On Tuesday, 6,450 ballots were cast, and the budget passed by 68 votes. That's a margin of 1 percent. Neither Tillotson nor Schrader expect the outcome to change. Schrader said the tabulator machines are reliable, and sensitive enough to register votes even if ballots are filled out sloppily. "The tabulators are programmed to pick up a portion of a mark in an oval so even if someone makes a check mark or a cross, it will still calculate that as a vote and if for some reason, there is a stray mark in both ovals, the ballot would be kicked out as invalid, and the person could vote again." And while it means more work, Shrader agrees that there's value to the exercise. "It allows us to check the system to make sure it's working as it is supposed to." Tuesday's special election cost approximately $25,000, according to Schrader, but he said the recount won't bring an additional expense. That's because city councilors who sit on the Board of Civil Authority are charged with the task of hand-counting the ballots, and they won't be paid for their work. They must complete the recount within five days of the request, which gives them until Tuesday. Schrader said the councilors will sit down at a table, divide the ballots into stacks of 50 or 100, sort those stacks into "yes" and "no" piles and then tally them up.